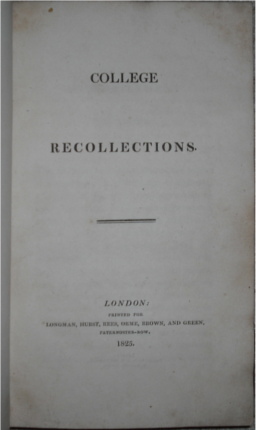 The recollections of a student of Trinity College Dublin in the early 19th century. Under a mask of anonymity he reveals the salacious and tragic escapades of his contemporaries, including the profligate Lorton. Each chapter concerns another of his fellows, their behavior at university and their subsequent fates. 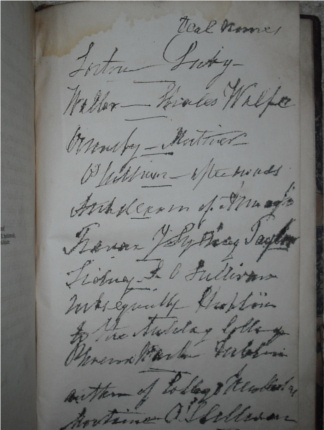 At the rear of the book a previous owner has listed the author and characters' real names. We can see, for example, that Waller is Charles Wolfe, the Irish poet and clergyman who graduated from the college in 1814. Half calf and marbled boards with gilt lettering. Leather is worn but the binding is strong. Endpapers are foxed and stained but the interior is clean. Owner's inscription at front.